Since the game of golf reached the United States in the 1890s, golf equipment has embraced technology in a big way. Club manufacturers are using the latest science to improve club performance and are releasing new lines of clubs every year. With constant innovation, the golf ball is flying farther than ever before. Golf instruction also has made huge strides in helping golfers learn the game by leveraging new tools and new technology. One area that hasn’t changed much has been transportation on the golf course. Golfers have had the choice to walk and carry their clubs, use a pull cart, walk with a caddy carrying their clubs or ride in a two-person golf cart. But recently, golfers have been presented with innovative new transportation options on the golf course. 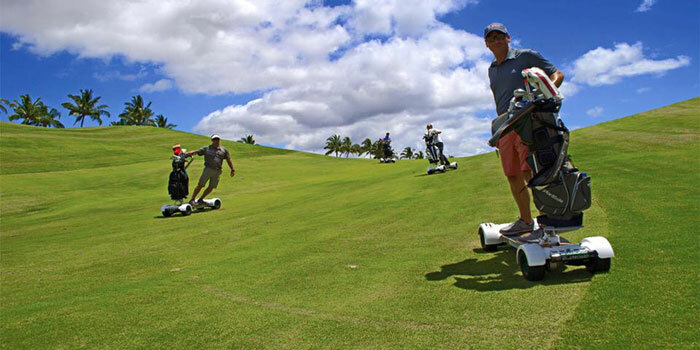 Motorized, single rider vehicles such as golf boards and scooters are changing the way golfers experience the game. Golf boards are maneuverable electric skateboards that can reach speeds up to 14 mph and are designed to carry golfers and their gear. The GolfBoard brand is currently available at over 250 courses around the world, including 28 in the Chicagoland area. The product won Best New Product at the PGA Merchandise Show in 2014. 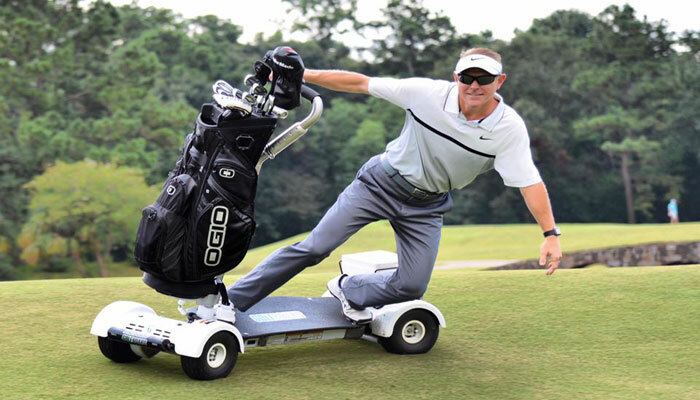 Developed by legendary surfer Laird Hamilton, Bally’s Total Fitness founder Don Wildman and a team of Oregon-based entrepreneurs, GolfBoard is changing the face of on course transportation. The goal of the product is to hook the next generation of golfers by combining the fun of surfing and skateboarding with the beauty of a golf course. The boards use rechargeable lithium-ion batteries built into the base of the board to help provide a smooth ride on rolling terrain. Charging the boards takes approximately two hours and the battery packs a life of approximately 3,500 rounds of golf. Using a golf board is designed to be intuitive. Like a skateboard, you place one foot in front of the other, with your clubs in front. The bar-mounted thumb throttle is located at the center of the handlebars. Press down on the throttle to move forward. Release the throttle and the engine cuts out for a quick stop. Riders simply lean side to side to control the turning of the board. A low/high speed switch helps provide a practice mode for beginner riders to help increase their confidence before experiencing higher speeds. Most Golf Boards offer a stability bar and a bag holder to help provide assurance and improve balance. Golf Boards are extremely stable because they were designed to have the lowest possible center of gravity, creating a surf like experience. The low center of gravity makes it easy to step on the board at each shot and allows the rider to feel like they are in contact with the terrain. Golf Boards were designed to be used on virtually every type of terrain and surface including steep grassy slopes and paved trails, to soft turf terrain and loose gravel. They come with large turf tires that were designed to provide maximum traction and balance, while keeping the boards in beautiful condition. They’re also a healthier alternative for the golf course by helping to reduce soil compaction and turf stress since the combined weight of the rider and Golf Board is significantly less than that of a golf cart. Using a four wheel-drive system also allows power to be distributed to all four wheels equally, which provides smooth acceleration and ensures a fluid increase in speed that won’t cause turf-damaging burnouts. Golf Boards have been engineered to make the smallest possible degree of turf impact to help minimize injury to turf. The boards can reduce turf wear by as much as 75% because they offer approximately the same PSI as a golf cart (6lbs per square inch), but only 25% of the footprint. Another benefit of the Golf Board is they can dramatically increase the pace-of-play. According to GolfBoard, the average 18-hole round on the board is 2:37. A big benefit is each Golf Board golfer can go directly to their ball while a two-person cart often must cover a much greater distance. Most courses view Golf Boards as a supplement to two-person golf carts. The boards are being used as an opportunity to bring in new membership by providing an easy, intuitive and stable for first-time users. Players with no riding experience often try a Golf Board and end up riding comfortably after just a few minutes of practice. With faster charging and greatly reduced maintenance costs compared to regular golf carts, Golf Boards also are much smaller and therefore take up less space in between use. Most golf courses typically provide a detailed safety program, which all new riders must complete before operating a Golf Board. New users are also required to sign a liability release acknowledging that they understand the operation and safety principles. With initial funding of $100,000 on Kickstarter, the company began selling Golf Boards for about $4,000 apiece. Initial response was strong, and the company hasn’t looked back. Golf courses can purchase or lease golf boards, with financing available for most.